Nimble makes it simple to collaborate with your team to share contacts, activity, messages, deals and more. Setting up Nimble is as easy as using it! After reviewing the easy to follow configuration guide below, you'll be able to quickly setup your Nimble account and start building stronger relationships with your customers and potential prospects. This guide is designed to be followed in the order that the configuration steps are listed. However, not all checklist items will apply to your specific business needs. Please Note: The Account Owner is the only Nimble user with permissions to set the following controls. Visit Settings >> Users to add licenses to the account. One license in Nimble can be occupied by one user at a time. Once you have added licenses, you will then be able to invite team members to fill those licenses. Just click "Invite Users" then enter the associates email address(es). Once you've added your team members to the account, you can then set permissions. Permission includes enabling users to bulk export, bulk delete, access API, configure deal's pipeline and deal privacy. Once your team members are added to the account, they will then be able to import their contacts and companies. It's important to note that contacts are shared as a way to work seamlessly with your colleagues. Contacts cannot be made private, however, this option is on our roadmap. To ensure that you bring a clean list of contacts to Nimble, you may consider checking for duplicates and outdated information prior to import. If you wish to import data into custom fields in Nimble, you can add those columns and the appropriate field values to your CSV file. Custom Fields can be created upon import or before within the Settings >> Data Fields page. 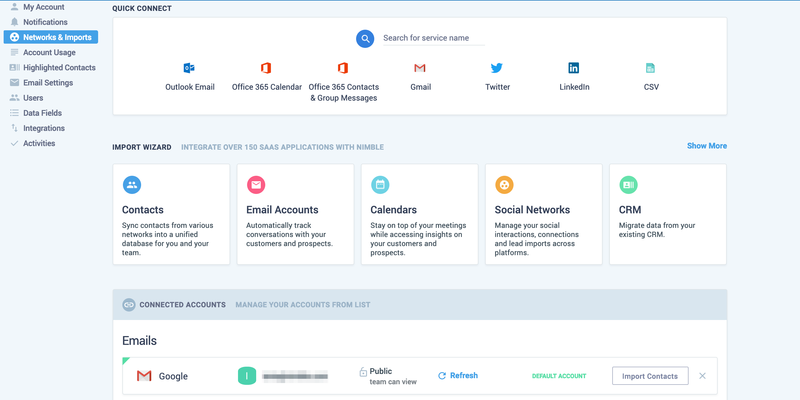 Your team will be able to connect multiple email accounts to Nimble to create a bidirectional sync. Messages are automatically set to private, however, selecting the padlock icon on the connected email account will enable you to share messages with the team. To productively use Nimble anywhere on the web and within your Inbox, your team can download our Nimble Contact Apps. The Nimble Smart contacts app can be added to Chrome, Safari, Firefox or Edge to help you access Nimble from anywhere on the web and it also delivers powerful sales insights on potential and existing prospects. For Gmail users, the add-in automatically appears next to your Gmail threads when the Nimble Smart Contacts App is installed to your browser. Nimble’s mobile application gives you a powerful sales and relationship management solution while you’re out of the office. Add it on iTunes or Google Play. Creating Tags in Nimble will help your company keep your contacts organized in groups. As an example, Tags can be utilized to group People/Companies or Activities by category, industry, association, type, ownership, importance, and more. Add Tags to Tasks in Nimble by first creating a Task and adding the Tag from there. Tags for Tasks are separate than for People/Companies. Configuring Custom Fields is a key way to support specific data capture requirements that are unique to your company. Selecting Tab and Field names, field types, pick-list values, 1 or 2 column width, field position and order all have an impact on configuration ease of use and strategic value to support work flows, tracking, database segmentation, and other actions that are data driven. Once you have identified the custom fields to be created. Organize them into logical groupings so that they can be displayed under Custom Tabs. This can be set up within Settings >> Data Fields. Setting up Pipelines allows your company to track the sales cycle of a Deal. Your company can have multiple pipelines to address different sales cycles related to varying product, service, or other offerings. Pipelines can also be used to track other projects that move through stages, such as Marketing, Public Relations, and Business Development. Define the stage names for each pipeline. Define the number of days a deal should last in each stage for your pipelines. Define the amount ranges for each pipeline.